00:45:00 Makes 8 servings, 1 sandwich (226 g) each. Makes 8 servings, 1 sandwich (226 g) each. Homemade falafels are easier than you think. 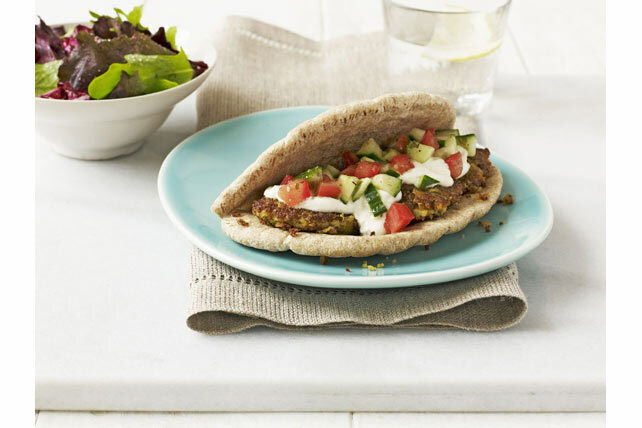 Just follow our simple steps to make these falafel patties and then stuff them into fresh pita bread with all of the fixings! Process first 6 ingredients and half the cilantro in food processor until smooth. Shape into 24 (2-inch) patties, using about 2-1/2 Tbsp. chickpea mixture for each. Place in single layer on baking sheet. Refrigerate 15 min. Meanwhile, mix sour cream, tahini and lemon juice until well blended. Combine cucumbers, tomatoes, remaining cilantro and dressing in separate bowl. Refrigerate both until ready to use. Heat 1 Tbsp. oil in large nonstick skillet on medium heat. Add half the falafel patties; cook 3 min. on each side or until browned on both sides. Remove from heat; cover to keep warm. Repeat with remaining oil and patties. Top each pita with 3 falafel patties, sour cream mixture and cucumber mixture. Prepare using Miracle Whip Calorie-Wise Dressing, light sour cream, and Kraft Calorie-Wise Greek with Feta & Oregano Dressing & Marinade. Use small ice cream scoop to make falafel patties. Serving Size Makes 8 servings, 1 sandwich (226 g) each.